I just finished Spellbinder and it was just as good as I remembered the first time. Luckily I have the next book in the series here--The Midnight Gate--and I'll be reading that today too! 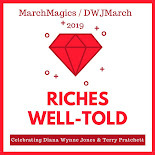 First though, I have only read one of the four pieces for the Fragile Things group tomorrow so I'll read one or two of those and maybe a short story or two from Diana Wynne Jones from Unexpected Magic before I start in on The Midnight Gate. I still need that shower so I suppose I will do that now, get into some different comfy clothes and then sit back down with Neil and Diana (and some candy)!